You probably have to be of a certain age, a big fan of old movies, or a member of the Doris Day Fan Club to appreciate this month’s title. Que Sera Sera is a 1956 song sung by Day and featured in The Man Who Knew Too Much. This classic film was directed by wine connoisseur Alfred Hitchcock, whose favorite winery was Simi in Sonoma. But, of course, we’re not writing about old movies, Alfred Hitchcock or Doris Day, we’re concerned with the grape called Syrah (or Shiraz as it is known in some parts of the world). We’ve been in a Syrah State-of-Mind for a while now. In part, this comes from the fact that Syrah has been our chosen grape for learning about the winemaking process (read more at Stomping Grapes and Making Wine Thirsty Kitten Style). Yet an even larger reason is because Syrah has such a wide spectrum of styles that it provides endless options for tasting and comparison. Some of our readers tell us they are not Syrah fans, saying they’ve tried an over-the-top bold version and felt it was too much for their tastebuds. Others have tried a lighter style Syrah and were disappointed that it lacked the opulence and richness they were seeking. Well, we’re here to tell you that if you’ve tasted one Syrah, you definitely have not tasted them all. From the nuanced, elegance typically associated with Syrah grown in cool climates like France’s Northern Rhône to the big, bold wines typically associated with warm climates like Australia, Syrah is a gigantic playground of tasting opportunities. Since tastebuds vary widely, we assembled a Panel of Experts (henceforth called The POE) to help illuminate the joys and variations in wines produced from this grape. 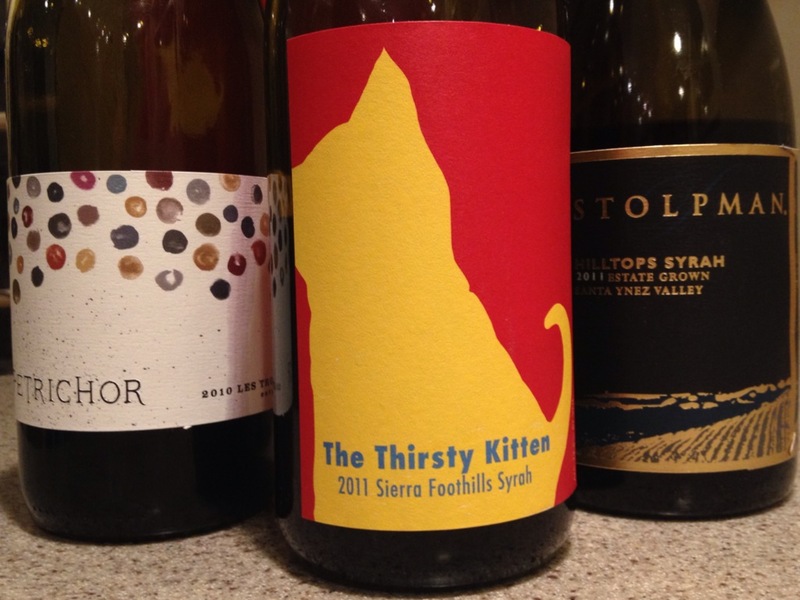 An eclectic group of bloggers and friends, The POE graciously offered a delightful range of thoughts on Syrah. POE participant Michelle Williams, who lives in Dallas, Texas and is known as @Fiery01Red on Twitter, said “I like a fuller, jammy Syrah that has a nice spice in the back.” She enjoys pairing this style Syrah with lamb or spicy dishes and noted that just the evening before she had enjoyed a Syrah by Bridgman Cellars in Washington State. Dan Quinn from Howell, Michigan, @MightyQuinn-13 on Twitter, chimed in with this excellent point: “Syrah having a wide range of styles is what makes it great. For me, full-bodied Syrah needs spice, while lighter Syrah needs balance.” We noted that Dan’s cover picture on Twitter is of Qupé, a winery that has pioneered California Syrah, so we know Dan knows what he’s talking about. Fellow Twin Citian Jeff Burrows, who has a beautiful food-wine blog and is known as @foodwineclick on Twitter, echoed Dan’s sentiment. “I love having a wide range of styles; room for all tastes!” he said. His personal preference is for “cool climate, low acid, low oak,” which makes great wine for the table. His favorites among California Syrahs are Wind Gap Wines and Anthill Farms. 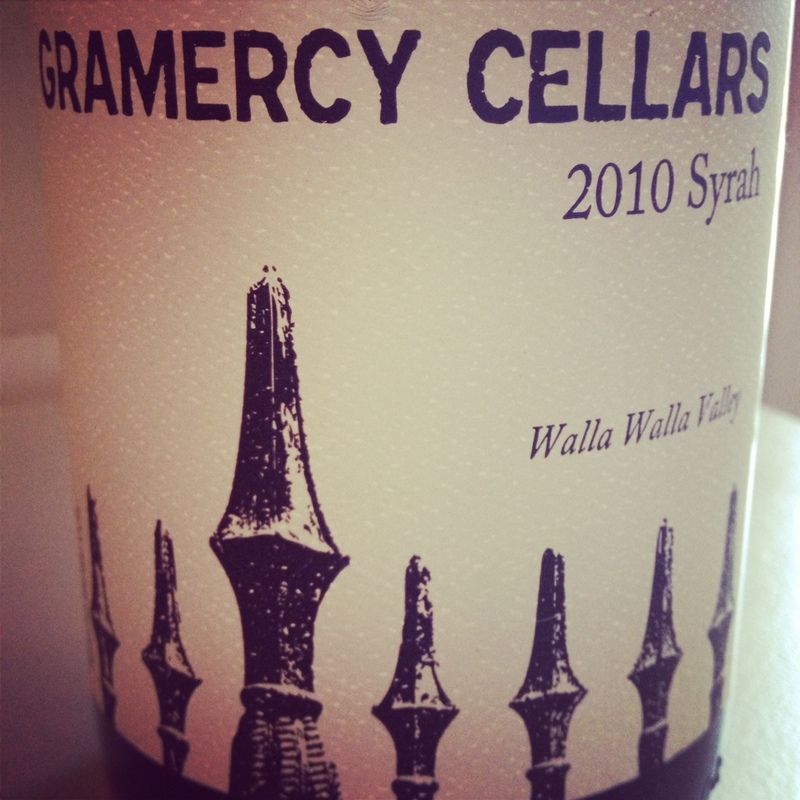 For Washington Syrah he favors Gramercy Cellars. And for French Syrah, he recommends Domaine Jean-Louis Chave‘s historic family wine, Saint-Joseph, grown on a hillside vineyard on their estate. Anthony Davies, the only non-U.S. contributor to The POE, tweets as @winegeekconfess and also writes an informative blog from his home base of Watford in the United Kingdom. He recommends “Jean-Luc Colombo Cornas for big rustic funk.” Cornas, on the steep hillsides the Rhône’s right bank, is claimed by some to be the birthplace of Sryah. Davies added, though, that it is “difficult to look any further than Cave de Tain Crozes [Hermitage]” when seeking a well balanced Syrah. To this already brilliant list of suggestions, we humbly offer just a few more because there’s no such thing as too many choices. Truchard Syrah has been a long-time favorite ours. Newer discoveries for us are: Bink, Petrichor, Stolpman, Kunin and Zotovich. All from California, Truchard in the Carneros is probably the boldest flavored of them all, with Bink in the Anderson Valley following next, while Petrichor from the Mayacamas Mountains and the remaining three from Santa Barbara County continue along the spectrum toward the more Rhône-style California Syrahs. Your head is likely spinning by now with all the choices we’ve casually listed, yet, in reality, we’ve only scratched the surface. So this month, we toast to the celebration of abundance and variety. Which style will you like best? As Doris sings, “Que sera sera, whatever will be, will be.” Have fun finding out. Cheers! Fun post!! I’ve always wanted some fancy initials to put after my name. The Armchair Sommelier, POE . . . it has a ring, doesn’t it? 😉 If you’re ever in Virginia, I know a few places that have very happy hours! Salud!! Now that you mention it, POE does have a distinguished ring to it. :) We’ll make it our mission to visit Virginia wine country. Thanks again for sharing your thoughts for this post! Cheers! Thanks, Patty! Glad it was the good kind of overwhelm! Always enjoy exchanging notes with you— whether here, instagram or twitter. Cheers and happy sipping! It sure was fun hearing everyones’ favorites. A long list of Syrahs to sample! Thanks to the whole bunch, quite the POE. I am a big fan on most Syrah/Shiraz and often forget about it’s versatility. Some great stuff coming out of NZ these days too – in the next 10 years Syrah could give Pinot a run for it’s money as NZ’s signature red. But more than anything else, I will be wearing my POE badge with immense pride all week!! Thanks, Jeff. Appreciated your adding your thoughts and suggestions to the list. A great conversation! So glad you were part of the POE conversation, WineGeek! Great point on New Zealand as a place to watch for Syrah. Looking forward to keeping up with your blog now. Your #newwinethisweek series is fabulous. Cheers! Great post! Had I known why you were asking, I would have sat up in my death bed, and put a little more thought into it! I like all styles of Syrah–the jammy, over-the-top-but-still-balanced style (DuMOL comes to mind) as well as the more restrained French style–I love Côte Rotie as well as the more rustic St. Joseph. Thanks, Jeff. I didn’t have the idea for the POE when I asked the question, but it seemed obvious once the answers started coming in. It was so much fun I will definitely do it again. Next time will hashtag it as #POE so people know. Love it that you happily sip all across the Syrah spectrum. Very nice additions to the list! Cheers.